The researchers from the universities of Bristol, Exeter and King’s College London, and the Eunice Kennedy Shriver National Institute of Child Health and Human Development, found that the teenagers were more at risk of these conditions if their mother was sensation-seeking, impulsive, angry, suspicious or detached during their childhood. The more of these personality traits the mother had, the greater the risk to her child’s mental health. It also held true even after a range of other key factors associated with such personality traits were considered. These included the mother’s education, her age when she gave birth, whether or not she was a single parent, whether she was a binge drinker when her child was young, whether she smoked, her family income, financial problems, and any history of partner violence. According to the researchers, this is the first time the impact of a mother’s personality on her child’s future mental health has been assessed in such a large group of people who have been studied for such a long period of time – from when they were in utero in 1991 or 1992 to the present day (now aged 25 or 26). ‘We don’t know why these aspects of a mother’s personality can affect her child in this way. But there are a number of potential explanations which should be explored further. ‘All of the personality traits we assessed are related to emotional and relationship difficulties. In the context of motherhood, this may make responding to the child’s emotions and building a consistent, secure relationship with them more difficult. ‘For example, if the mother is suspicious of, or detached from, her child the child may find it harder to build a strong emotional attachment to their mother, which can affect the child’s emotional development and relationships with others. ‘Second, if the mother is prone to impulsive behaviour, she may struggle to maintain consistency and her child may feel insecure and lacking boundaries. This can also lead to depression and anxiety. 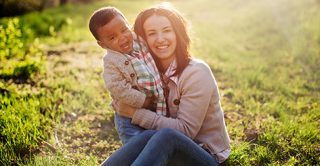 ‘Very few studies have looked at the link between a mother’s personality traits and the future mental health of her children. Our findings suggest that mothers who are prone to being sensation-seeking, impulsive, angry, suspicious or detached, are at greater risk of having children, who themselves later experience serious mental-health problems. The paper: Pearson, R. et al. Impact of dysfunctional maternal personality traits on risk of offspring depression, anxiety and self-harm at age 18 years: a population-based longitudinal study. Psychological Medicine. doi:10.1017/S0033291717001246 is published today (Tuesday 6 June 2017).